244 pages | 10 Color Illus. | 25 B/W Illus. This book is the first study to consider the extraordinary manuscript now known as the Carrara Herbal (British Library, Egerton 2020) within the complex network of medical, artistic and intellectual traditions from which it emerged. The manuscript contains an illustrated, vernacular copy of the thirteenth-century pharmacopeia by Ibn Sarābī, an Arabic-speaking Christian physician working in al-Andalus known in the West as Serapion the Younger. By 1290, Serapion’s treatise was available in Latin translation and circulated widely in medical schools across the Italian peninsula. Commissioned in the late fourteenth century by the prince of Padua, Francesco II ‘il Novello’ da Carrara (r. 1390–1405), the Carrara Herbal attests to the growing presence of Arabic medicine both inside and outside of the University. Its contents speak to the Carrara family’s historic role as patrons and protectors of the Studium, yet its form – a luxury book in Paduan dialect adorned with family heraldry and stylistically diverse representations of plants – locates it in court culture. In particular, the manuscript’s form connects Serapion’s treatise to patterns of book collection and rhetorics of self-making encouraged by humanists and practiced by Francesco’s ancestors. Beginning with Petrarch (1304–74) and continuing with Pier Paolo Vergerio (ca. 1369–1444), humanists held privileged positions in the Carrara court, and humanist culture vied with the University’s successes for leading roles in Carrara self-promotion. With the other illustrated books in the prince’s collection, the Herbal negotiated these traditional arenas of family patronage and brought them into confluence, promoting Francesco as an ideal ‘physician prince’ capable of ensuring the moral and physical health of Padua. Considered in this way, the Carrara Herbal is the product of an intersection between the Pan-Mediterranean transmission of medical knowledge and the rise of humanism in the Italian courts, an intersection typically attributed to the later Renaissance. ‘With respect to the topic relating medicine to Humanism, the relevant sections – the bulk of the book – are erudite, carefully referenced and are an important addition to studies of Humanism in late Medieval Italy’ – Garden History (45:2). ‘Kyle’s extensive exploration starts from the Carrara Herbal as an object, and her investigation of its various contexts makes her cross and recross the boundaries between art history, the study of humanism, and the history of medicine … The erudition that underpins this study is massive, and ranges widely in terms of subjects as well as a long way back in history’ – Nuncius (33; 2018). 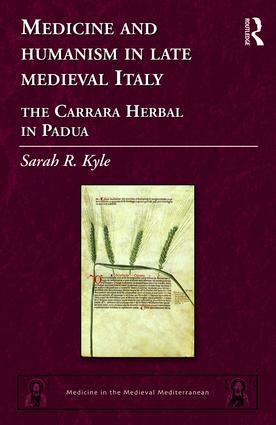 ‘Sarah Kyle’s Medicine and Humanism in Late Medieval Italy: The Carrara Herbal is the delightful and useful first book of a young scholar… Kyle is an art historian at the University of Central Oklahoma with a penchant for interdisciplinarity. She is at her best writing about art history, something that she does with remarkable clarity in beautiful prose. She is equally remarkable at tackling medical history subjects… Overall, Kyle has managed to produce a good first book, which will be useful to American undergraduates, and will delight more experienced researchers with its interdisciplinary flair’ - British Journal for the History of Science (51:1; 2018). ‘… Kyle gelingt es durch eine bemerkenswerte Literaturrecherche eindrucksvoll, die diversen Quellen, Traditionsstränge, das kulturelle und höfische Umfeld, das wissenschaftliche Milieu und die künstlerischen Kontexte der einzigartigen Handschrift zu entschlüsseln. Das wahre Verständnis des Herbariums ist, folgt man ihr, nur möglich, wenn man den Inhalt mit weiteren zeitgenössischen Paduaner Manuskripten korreliert und als programmatischen Anspruch einer umfassenden höfischen Kultur interpretiert. Padua wurde in dieser Hinsicht, was die Selbstinszenierung und kulturelle Konstruktion der Herrscherfamilie betraf, sogar für die Florentiner Medici, geschweige denn viele kleinere Signorien in Oberitalien zum Vorbild’ - Zeitschrift für Historische Forschung 45, 2018. (In English translation: ‘… Kyle impressively succeeds, through remarkable research into the literature, in deciphering this unique manuscript’s diverse sources, strands of tradition, cultural and courtly environment, scientific milieu, and artistic contexts. The true understanding of the herbal, to follow her argument, is possible only if one correlates the content with additional contemporary Paduan manuscripts and interprets it as a programmatic claim of an extensive courtly culture. In this respect, as regards the self-presentation and cultural construction of the ruling [Carrara] family, Padua became the model not only for the many smaller signorie in northern Italy, but even for the Florentine Medici’).